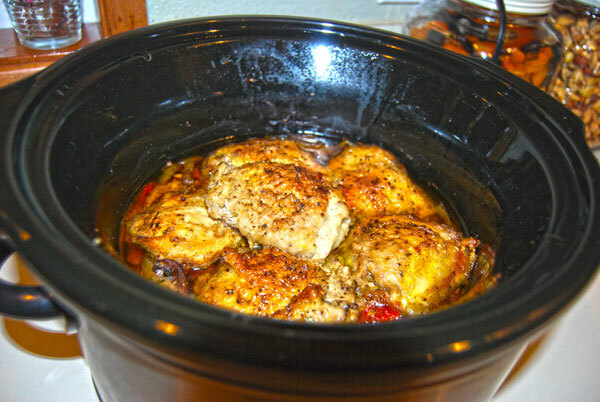 I recently adapted one of my favorite recipes ( Stovetop Chicken Cacciatore ) for the crockpot. Why adapt ? I find with the slow cooker that veggies “give up” far more liquid in the crockpot, and that chicken breast seems to dry out. I reduced the amount of tomatoes, and swapped out the breast for bone in (skin on) thighs which contribute to the very flavorful sauce. You can remove the skin if you want, it’s tasty either way. This can be prepped the night before, and plugged in before you leave for work. Lay chicken flat on a plate, sprinkle half the flour over the top, Turn pieces over and do the same for the other side. Heat the oil in a large non-stick pan over medium-high heat. Add chicken to the pan, and brown both sides. Remember the goal is just to brown (not cook!). 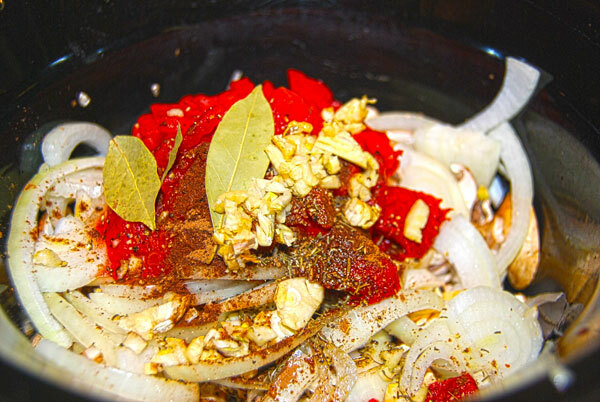 While chicken is browning, add mushrooms, onions, tomatoes, tomato paste, garlic, white wine to the slow cooker. Sprinkle with allspice, thyme, salt, and pepper. Add bay leaves. Layer the chicken over the top of the veggies, cover, and cook on high for 4 hours, or low for 8 hours. 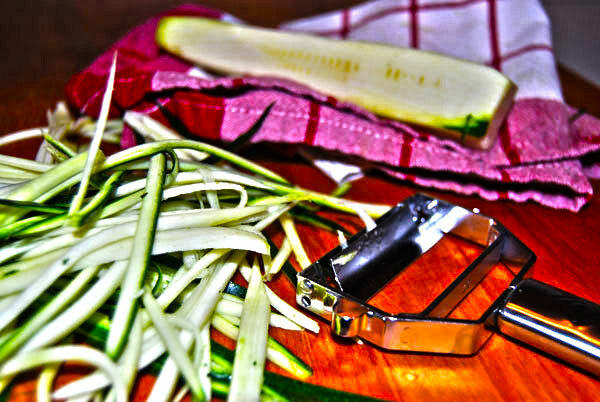 For the “Noodles” I julienned 3 large zucchinis, and sauteed over high heat in a little olive oil for a minute or two. You can cook up a batch of real noodles (my kiddo likes penne) or rice for the rest of the family if they are not low carbing with you. 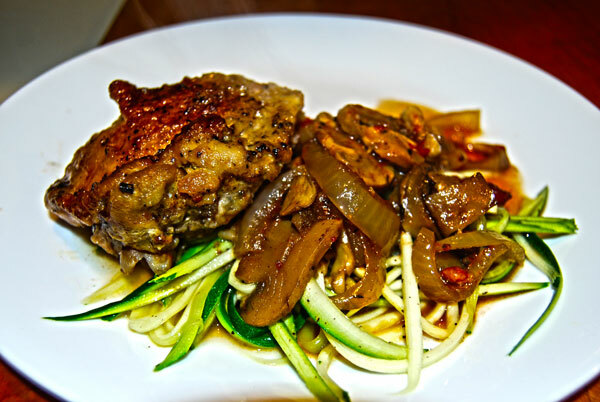 Yummy looking recipe….but in order for it to be paleo you would have to eliminate the flour from the first step. I’ve successfully dredged in almond flour, coconut flour and arrowroot powder. Thanks Shannon ! Do the alternatives do any thickening as well ? They help a little bit. Arrowroot works well for thickening…..potato starch does too but my experience is that the potato starch gets clumpy and gluey. Nice ! Have a delicious diner ! Ooooh, I’m going to have to try this. I have to cook dairy-free now, but this would be just fine!